On the weekend we embarked on a major challenge – carrying out repairs and maintenance on all three mountains of the Three Peaks Challenge. 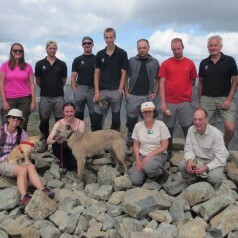 Sarah Lewis from the John Muir Trust has written a great blog on their adventures on Ben Nevis, there’s an update coming soon from Scafell Pike and here’s a little update on our adventures on Snowdon. 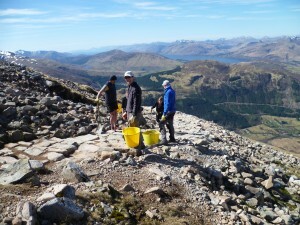 The work party on Ben Nevis on Sunday was unequivocally about the quality of the day over any size aspirations (not that we’re competitive Snowdon and Scafell!!). Glorious alpine-like weather for our hardy team of four…Susan and Dennis (Susan has just taken up the post of Nevis Landscape Volunteer Co-ordinator, they have a great volunteer ranger scheme coming up shortly) and Keith joined us from Glencoe. We’ve had a great run of good weather and the hills are glorious just now, but if you’re planning on climbing Scotland’s highest mountain as part of your challenge then winter is still very much present on the top part of Ben Nevis. 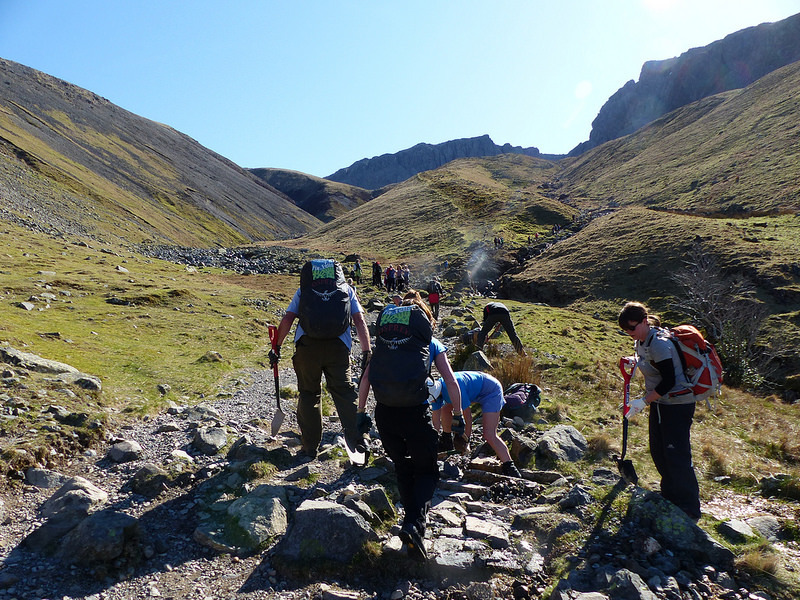 Three co-ordinated Mountain Care days are being held across the highest peaks of Scotland, England and Wales this weekend to highlight the launch of a new piece of ‘kit’ for charity challengers. The new kit won’t be found on the slopes of the nation’s favourite mountains, but online, as a central resource with useful route maps, environmental information, health and safety tips and a simple one stop registration process. 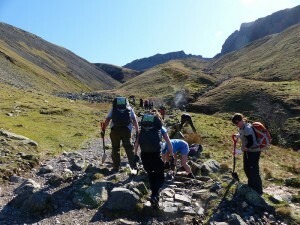 Thousands of people each year scale Ben Nevis, Scafell and Snowdon, with many trying to summit all three peaks in one trip. The longer days of summer see numbers taking part rising dramatically, with consequent impacts on the paths and nearby communities. 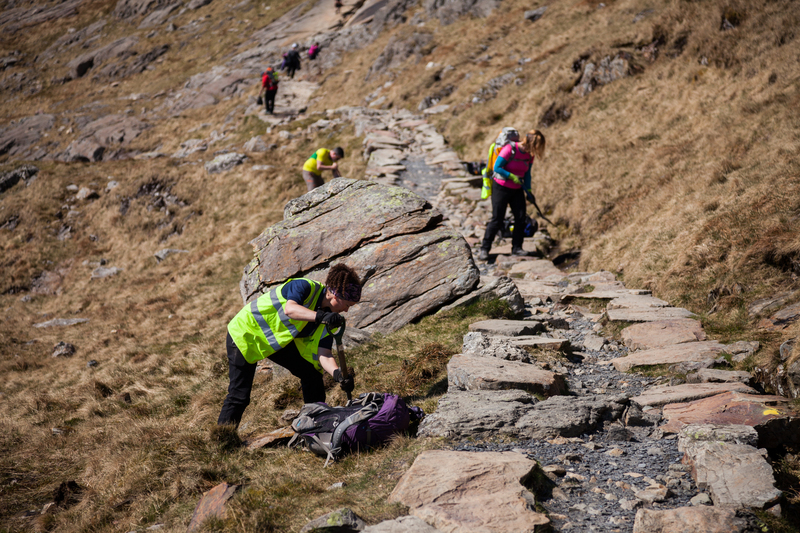 Come and join us this weekend; Saturday 18th April on Scafell and Snowdon and Sunday 19th April on Ben Nevis, as part of our launch bonanza for the new website.